Discussion in 'General Sports' started by 75cent bleacher seat, Jan 30, 2013. There are different types of surfers....those who surf recreationally and those for which it is a lifestyle where virtually everything is secondary to surfing. Meaning, no steady job, no car, no girlfriend, etc...just the next wave. And then, the big wave surfers who chase about the world. Check out the video...Cool to see he's originally from Pittsfield Mass. Last year I was on the north shore of Oahu watching some 25-30 foot waves and some guys in Waimea Bay tackling them. Driving on the road parallel to the beach, it still looks like nothing - energetic stuff but not all that different from a normal day. But once you get on the beach and go down to the edge of the water, and see these towering masses of water rising 4 or 5 times your height and crashing down before you have a chance to think about it... I've never been so scared in my life as I was by the idea of getting out there. I've gotten wrecked surfing 5-6 foot waves with just sand underneath, and it's a powerless feeling. I just can't imagine the stones these guys have to get out there at, say, Pipeline, and ride over the top of sharp reef rocks where a little misstep could see a broken leg, a concussion, or worse. And they're in a spot where, unlike a fixed ski slope or a parachute, the conditions they're on could change in a fraction of a second and they'd be unable to adjust. 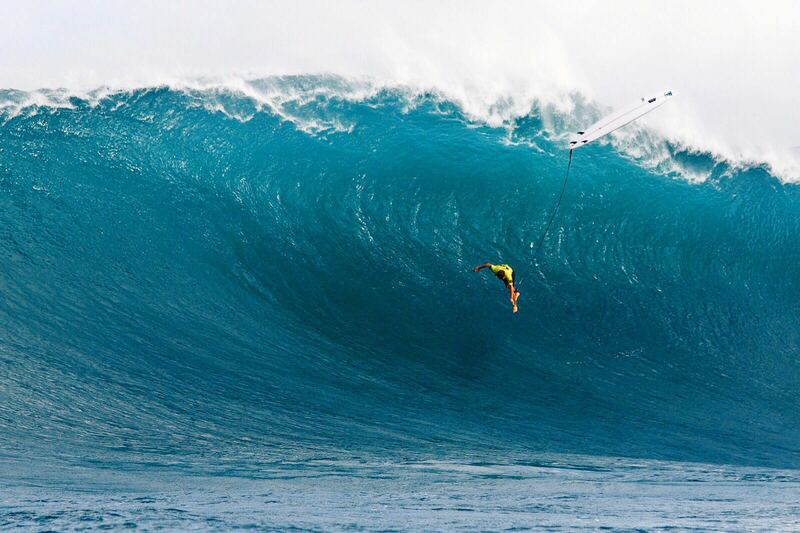 For my money, the guys who do big wave surfing are some of the bravest, most fearless people on the planet. Last year I was on the north shore of Oahu watching some 25-30 foot waves and some guys in Waimea Bay tackling them. Driving on the road parallel to the beach, it still looks like nothing - energetic stuff but not all that different from a normal day. How much was the car rental? Free. We boosted the thing. Its owner lives there. I live at the beach obviously, and while I'm not into it, there is a huge culture in my neighborhood of adults and kids who surf (live to surf). One friend of mine is a huge surfer (his whole life, really good, his kids nationally ranked, etc) and he's told me numerous times he wouldn't get near a big wave. It's a different animal, even for those that are die hard surfers. He owns his own business and if swellinfo.com says there's waves, the thing practically shuts down. Man, if you take a look at the jet ski tow-in guy in Vinho Tinto's post @ #2, I can only imagine what happens to the rider if he fails to make that escape turn over the crest to the left in time. Can you imagine tumbling with about a 400 pound machine down a 65-degree slope? Ouch. And I have to second Mental's observation that from a distance it might not look like all that much, but when I lived in Oahu a while back and visited the north shore on those north wind "kick up" days, man those waves are another sight to behold up close. Watch the final day of the Pipeline Masters. This could be one of the better final contests of the year for the ASP. The World Champ will also be crowned. It could either be Nick Fanning or Kelly Slater. Huge waves today on the North Shore of Oahu. Contest starts at 3:00pm EST. The same XXL swell that just slammed Hawaii is now going off on the West Coast. Catch some heavy big wave surfing all day at the Mavericks Invitational contest from Half Moon Bay. ...and they didn't even call the Eddie! WTF. wind direction the elements just didn't come together. The last time it did run was 2009. That was the first and only time I've gone to watch it. I spent the entire morning at Waimea Bay that day, watching and taking it all in. By noon there was something like 35,000 people lining the bay. Eddie went. John John Florence wins it. I didn't realize Clyde was still competing ; he came in 20th. Totally incredible that Clyde was out there at 66. Got pounded pretty heard on his first heat and came back and had a nice ride. He's wanted to do one last one, but it hasn't gone since 2009 so it's been a long wait for him.